PLAY a note. SHAKE your phone. FEEL the magic as the music responds to your slightest movement. Your iPhone is now a whole new magical instrument. Just cradle your phone in the palm of your hand like a guitar neck, and watch as beams of light approach your fingertips. Now press and hold to hear each note, then SHAKE your phone to bring your song to life. You won’t believe it ‘til you try it. "Climb up the stairway to heaven or down the highway to hell" - Venture Beat "Smule's latest musical brainchild" - TechCrunch You control the notes, speed, guitar type, pitch and vibrato. Swipe your finger across the screen to bend any note. Play it once, play it a hundred times, each time is a unique experience that won’t get old. PLAY LEGENDARY SONGS YOUR WAY Jam on your favorite rock, classical, folk and pop songs with your new magic guitar – no practice necessary. • Simply touch the beams of lights to play all styles of music, from soulful jams to scorching shred. • Express your creativity and shake your phone to create vibrato, or drag your fingers to bend the pitch. 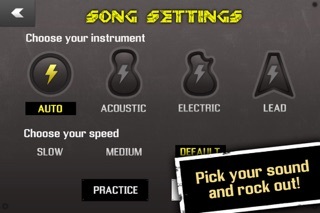 • Choose from different guitar sounds and speeds to make each song your own. 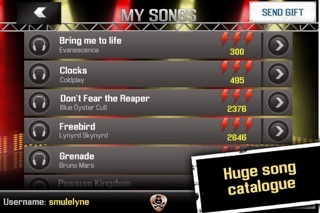 Magic Guitar’s songbook includes a huge catalog of legendary artists including: -The Rolling Stones -KISS -Daughtry -Fall Out Boy -Sublime -Bruno Mars -Tom Petty & The Heartbreakers -Blink 182 -Incubus -Coldplay -Lady GaGa -Lynyrd Skynyrd -Evanescence -Styx -Poison -Credence Clearwater Revival -Blue Oyster Cult -Jason Mraz -Santana -Queensryche …and many more! We're adding FREE songs every week so make sure to come back frequently! **NOTE: Some users have reported issues with certain songs such as overly high pitched notes. We are actively fixing these and your copy will update automatically when they improve. Thanks for you patience and keep on jamming! 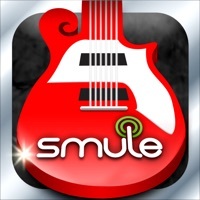 SHARE YOUR SONGS WITH THE WORLD Share your best jams on the interactive Smule globe, or through Twitter, Facebook or email. 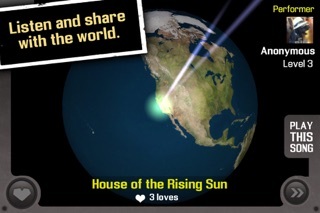 • Hang out on the Smule globe and listen to other Magic Guitarists rocking out. • Share the love – gift your friends any song from within the app to double the fun. 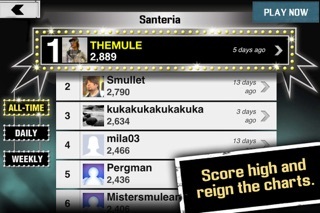 SCORE YOUR WAY TO THE TOP Once you’ve mastered your new guitar, get rewarded for playing. • Level up to unlock achievements and badges, earn new songs and make your way to the top of the song leader boards. PLEASE OPTIMIZE FOR IPAD MINI AND I WILL KEEP THE GOOD REVIEWS COMING. OPTIMIZE AND I WILL TELL MY FRIENDS GREAT THINGS ABOUT THIS GAME!!!! Beautifully done, reminds me of guitar hero. Lots of fun :) Recommend this and magic piano to all. Hoping for more songs soon although the current list is already quite impressive. So fun, could play for hours, but not so addicting to the point of needing to break a habit. It's perfect! Only non musicians will enjoy this app. Smule had a good idea here, but the controls are weird and the songs don't even sound like they are supposed to. Songs are way too slow. Do not get this app. Yo, Magic Guitar is SO addicting in an awesome way but could please make another to get shred, maybe we could earn it after songs? !